FisherPoets Gearshack, 1174 Commercial St. Admission buttons and fisherpoets’ chapbooks, CDs and art. Silent Auction opens. Bids close at 4 p.m. Saturday. Hanthorn Cannery Museum self-guided tour of the oldest existing fish processing plant on the Columbia. Mug up at Coffee Girl while you’re there. “Hooked on Rhyme: Taking Rhyme Beyond Couplets” with Peter Munro. Practice vivifying or killing poetry with rhyme. “Fishermen, Policy and Progress Toward Healthy Oceans” with Brad Warren, Julia Sanders and others from Global Ocean Health. See how Oregon and Washington are moving toward laws that cut carbon pollution and affect fishermen. “Open Mic.” Everyone welcome. Drop in with some friends to have a short go. “Revision: Finish Carpentry with Words” with Jon Broderick. Apply attention to detail, the right tools and some polish to your creative writing. 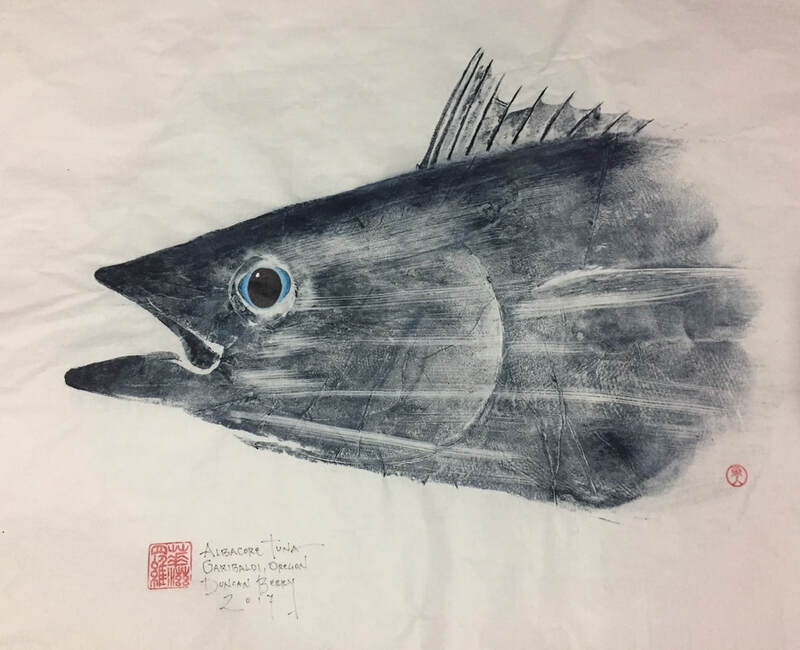 “Gyotaku: Japanese Fish Print Making” with Duncan Berry. Create a traditional fish print from albacore or salmon. ($25 materials fee. Sign up in advance at FPG Gearshack or phone Jamie Boyd at Studio 11 at 503.791.9435). Six short films with Steve Schoonmaker, Charlie and Cheryl Ess, Mark Titus, Marie Rose, Ryan Peterson and John Mellor. Welcome reception for photographer Corey Arnold. “We Are Bristol Bay” outdoor slideshow. Mesmerizing. Annual FisherPoets Dance with DJ Dinah Urell. Come on back and shake your boots. Late night cocktails. “Poetry at the Line: the first annual FisherPoets Slam” with Moe Bowstern. Eight fisherpoet contestants go cork for cork. Open Boat aboard the Cold Stream with Dave Densmore. The coffee’s always on. Admission buttons and fisherpoets’ chapbooks, CDs and art. Silent Auction bids close at 4 p.m.
Hanthorn Cannery Museum. Enjoy a self-guided tour of the oldest existing fish processing plant on the Columbia. Mug-up at Coffee Girl again. “Tides: the Science and Spirit of the Ocean” with Jonathan White. Marvel at the forces that keep the Earth’s oceans in ceaseless motion. “Songwriters’s Support Group: The Diddliest Catch” with John Palmes and others. Find encouragement and make progress. “Protecting Working Waterfronts and Community Fisheries” with Kevin Scribner and members of the Marine Fish Conservation Network. Learn from successes in Garibaldi. “Weaving Traditional Chafing Mats” with Greg Neitzel. Put to beautiful use at last those scavenged pieces of crab line you’ve found on the beach. “Singers’ Circle” with Mary Garvey. Who doesn’t want to sing ballads and shanties along with the Lower Columbia’s favorite singer and friends? “Protecting the Bristol Bay Watershed from Pebble Mine” with Melanie Brown and Elizabeth Herendeen of Salmon State. Learn of recent developments, imagine the future and decide what to do about it. “State of Wonder”: OPB’s weekly radio show about arts, culture and creativity broadcasts live from the FisherPoets Gathering. Join host April Baer for conversations and performances by fisherpoets. “Story Circle” with Jay Speakman. Hear commercial fishing veterans tell authentic stories, true mostly, about adventure and tedium working on the water. “Strength of the Tides” with Elma Burnham. Celebrate, support and empower women who work on the water. Share experiences, set goals, join the conversation. ($25 materials fee. Sign up in advance at the FPG Gearshack or phone Jamie Boyd at Studio 11 at 503.791.9435). “Open Mic.” Bring your best friends and your best shot. Everyone welcome to have a short go. Artist reception with photographer Tom Hilton. “We Are Bristol Bay” outdoor slideshow. A second mesmerizing evening. “Singers’ Gathering.” Didn’t’ get enough at the workshop this morning and still feel like singing together with friends? Stop in. “Umpteenth Annual On-Site Fisherpoetry Contest.” The 2018 rules will be announced by MCs at evening venues during the Gathering. Everyone wearing a 2018 FPG button is eligible to compete. You’ve got one. Have a go. Audience applause helps determine which winning poem is posted on the fisherpoets.org website. Harmony Singing workshop and Friendly Gospel Sing. John Palmes and friends lead another three-part harmony practice with surprisingly pleasant results, followed by the traditional gospel sing, just for fun. FisherPoets Gathering Farewell Mic. A very brief farewell read from lots of lingering scheduled fisherpoets.